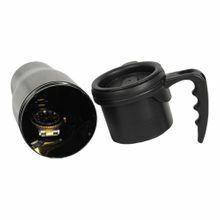 This Coffee Mug Safe allows you to enjoy your morning coffee knowing that your valuables are safely hidden. Most burglars spend less than six minutes inside a victim's home and only have time to check the most obvious places for valuables. This unique "safe" allows you to hide valuables inside a travel coffee mug, one of the last places a thief would think to look. You can hide jewlry, money, credit cards or other valuables out of sight and unlikely to be found. The top portion can actually be used as an insulated coffee thermos. It has a no-spill top and will hold about as much coffee as a standard coffee mug. When you unscrew the top from the bottom portion you are provided with an area approximately 3 inches tall by 2.5 inches in diameter to hide your valuables. Comes in black(ST) or grey(CE).